I'm starting this thread to take the activity out of the 2014 Melting Season thread. I'm going to see how much bother it is to copy comments over here. If you reply before I post the 'Comments completed' message you'll probably not be noticed, so hold off for now. What I do like to know, is what is going to happen volume-wise, especially with all that thicker ice in the core of the ice pack. If things continue like that, we won't be nearing ice-free conditions any time soon. Basically I think winter ice growth will oppose the factors that have led to strong ice volume loss over past decades. That volume loss is now at an end. We face a relatively slow transition to a seasonally sea ice free state some time late next decade to the 2030s. Quote: "To get to a state of near ice free conditions in late summer we will need to see significant thinning of the winter peak thickness, which needs far greater winter warming.". You forgot the word "soon" after the word "summer"? Because in some ~20 years tops, we'll see ice free Arctic even if April maximums will remain at present levels, i think. Here's why. Sir, if i am not mistaken, http://psc.apl.washington.edu/wordpress/wp-content/uploads/schweiger/ice_volume/BPIOMASIceVolumeAprSepCurrent.png insists that for last 4 years, maximum volume was some 22...23k km^3, while minimum volume was 3,7...5,5 km ^3. From this, i conclude that nowadays, some ~18k km^3 of sea ica melts to water every melt season. Your hypothesis is that max volume won't be dropping any much in the observable future (being FYU and all) - sound one (alas i'm not so sure thermodynamic equilibrium during winter would stay much like it is now - methane clathrates are bubbling, you know). Even if it would, - the quote above does not account for possible changes during melting season, which is the reason i am posting this. The difference is not astronomical: with the same ~22,5k maximums, all it takes to see an ice free Arctic ocean - is melt of extra ~4,5k km^3 of sea ice, which is 25% more ice melt per melt season. Since 1980, melt seasons have strengthened their melting power: an average melt season around 1980 was melting some 15,5k km^3 of sea ice, nowadays some average melt season melts some ~18k km^3 of sea ice, as mentioned above. Important part is, almost all of this increase of 2,5k km^3 - has happened not gradually "since 1980", but after ~2002, i.e. during last 12 years. And with the exception of 2013, this trend was accelerating, too. "To get to a state of near ice free conditions in late summer we will need to see significant thinning of the winter peak thickness, which needs far greater winter warming." Yes strongly agree with this. Perhaps also mention that if the ice is thinner at maximum then more ice is able to melt due to lower albedo. Therefore the peak volume doesn't have to decline by the full 4.5k Km^3. The words I would disagree with would be 'significantly' and 'far greater'. A 4k km^3 reduction from 22k km^3 might seem significant but if it has already fallen from 30k km^3 to 22k km^3 perhaps it is more like 'noticeable more' than 'significant' or 'far greater'. I would say the 'far greater' is particularly bad because there might be other ways of getting the thinning eg more mobility meaning more FYI and less MYI and slower rate of heat loss without necessarily requiring higher temperatures. Did you factor in a smaller winter window for the creation of the FYI? The trend is clear, melt starts earlier, goes on longer and the re-growth is later. If the window for FYI is, say, 4 months, instead of 5 or 6, what does this do to the thickness of the FYI? Would it be more like 1M instead of 2M. Or somewhere in between? Just a thought and something you did not mention, that I saw, in your article. Where I look specifically at the Central Arctic, because it is the central Arctic that must melt out to give ice free conditions. By definition ice free at the end of the melt season is when April Volume = Melt Season Loss. Melt season losses and April volume converge around 2020 assuming that April volume continues to drop. If I add in the estimated thinning of FYI of 1.5cm/year to the April volume then the projected sea ice free is in the mid 2020s. However all of that relies on continually increasing melt season losses. This is not guaranteed, nor is it likely in my opinion. 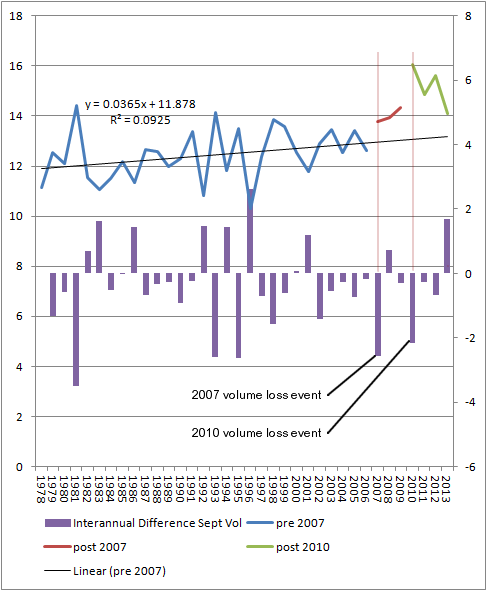 A large element of the increased losses is not due to a long term increase in volume loss during the melt season, but is due to step jumps after 2007 and 2010, both years of large volume loss. So while there has been a gradual increase of summer loss over the period 1989 to 2006, the (admitedly short) periods thereafter show step increases of summer loss. I've singled out 2007 and 2010 because they were years of substantial volume loss. This volume loss has led to a thinning of the ice which has aided more rapid melt in the melt season. Critical is understanding what is leading to the increased loss of volume during melt seasons. It is increased amounts of ice in thinner categories leading to greater open water formation and greater ice albedo feedback. If thickness merely tends to a nominal 2m in April then further gains through April thinning will not happen. The process will instead be more gradual. Therefore I doubt that seasonal losses will continue to increase as they have done in recent years. 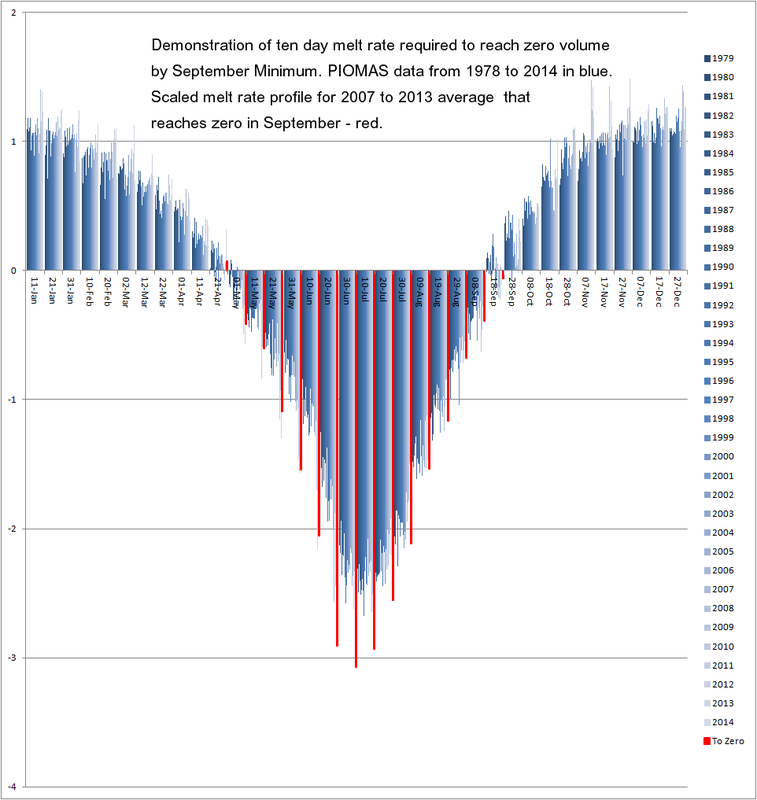 2007 and 2012 saw massive gains in volume despite delays to the onset of melt. This is because the rate of growth of ice for open water and thin ice is extremely fast. The following graphic is from Thorndike 1975. It shows how the rate of growth (cm/day) on the vertical axis varies with the ice thickness (horizontal axis). Say you increased the length of the freeze season, you'd get only small increase in thermodynamic thickening because by 1.5m and above the rate of ice growth is small. This is because as the ice thickens it better insulates ocean (warmer) from the colder atmosphere. So for anything over 1.5m thickness, shorten the freeze season even by as much as a month and you get very little impact on thermodynamic thickness, because growth to well over 1m thick is so extremely vigorous, once the sun has set and temperatures plummet. To get a freeze season as short as 4 months requires us to work back from the peak of volume in April, this is set by the rising of the sun. But we could move it back to March to be on the side of your suggestion. That would need freeze to start at the end of November, at which time in recent years the Arctic Ocean is already ice covered. In 2007 and 2012 the ocean wasn't ice covered until the end of November. As GHG levels increase and with further warming an even shorter, warmer freeze season is possible. But much of the warming we have already seen over winter is surface hugging and probably due to thinner ice. We will need a substantial increase in CO2/CH4 to counter the cold of winter, or a sudden appearance of strong cloud radiative feedback, I don't expect either to suddenly increase as much as needed in the next twenty years (e.g. CO2 levels when the Arctic was last winter ice free were at least double pre-industrial IIRC - 160ppm to go before we hit such levels). I would like to see people discuss what they think are the main causes. I am inclined to think upward heat flux, GHG levels, and winter temperatures rather than size of time window for thickening. If the length of time window was at all important we would presumably see thinning in the thin ice as well as the most frequently occurring thickness. Having said this I am still a little puzzled by the lack of thinning in the thin ice. Above looks like there is more thinning than thickening but looking at the data Chris Reynolds provided the change in volume for ice thinner than 1.5m is negligable. The thickness distribution in the thin ice is entirely a product of the weather pattern over winter. In the last three years all the ice up to 2 m on Chris's April graph has melted. So everthing below that is simply winter growth. I'd suggest that the growth of thick ice is a function of the ice's ability to move away from the Ellesmere/Greenland coast. This land area protects the ice from warmer water that effects all the rest of the ice, it allows the ice to regrow, ie Winter Freeze is greater than summer melt. However as the rest of the icepack loses multi-year ice the MYI of the Ellesmere/ Greenland coast is increasingly exposed to warmer waters and winds that lead to its collapse. Chris, I don't see any reason for the rate of summer melt increase to flatline, slow down, or even be linear. As the ice thins, the surface/volume ratio increases, which should increase the rate of melt. The thick MYI held off major assaults in 2017 and 2012, but that ice is nearly gone. What we have now is this "mesh ice" that spreads out as the edges melt (which, though it is a negative feedback (because it keeps more of the ocean covered with ice), is a short-lived one). That spreading increases the surface (both top and bottom) that can melt. "As the ice thins, the surface/volume ratio increases, which should increase the rate of melt." But that's my key point; the ice will not continue to thin as fast as it has done. We've lost all of the MYI that can be lost given that the ice doesn't melt away totally in the summer, now we have a residual MYI in a mainly first year ice pack. The thickness of the FYI is set by thermodynamic thickening over the winter. See the agreement between the loss of thick ice (>2m) and reduction in CT Area as ice >2m thick has increased. The wind was blowing at a speed of 11.8 meters per second (26.5 miles per hour) from South in Alert, Canada. The temperature was 12 degrees Celsius (54 degrees Fahrenheit). Air pressure was 998 hPa (29.47 inHg). Relative humidity was 58.0%. Towns on the North coast of Canada have been even warmer. I wouldn't. I talked of thermal equilibrium thickness before. Thickening above thermal equilibrium thickness is mainly dynamics. I.e. compression causing the ice to get thicker or slabbing. That happens as the general movement is towards CAA/Ellesmere/North Greenland coast not away from it. Growth then is a function of time available in that area to get crushed and thickened and the ice strength/ability to resist crushing. As the ice becomes more mobile it will spend less time there so less time to thicken. However as the equilibrium thickness declines so the strength and ability to resist crushing also declines. That doesn't make it easy to see what will happen in the future. What we have seen so far is a reduction in thickness of the ice (presumably as age of ice declines) but also a reduction in how wide the band of thick ice is along CAA/Ellesmere/North Greenland coast. I suspect this area of thick ice will continue to decline with the width continuing to decline. I think the maximum volume will continue to decline a little longer and at a very slow rate for a lot longer. This is subject to change - another year with max volume like 2013 or 2014 might persuade me that Chris Reynolds is right. Chris, I don't see any reason for the rate of summer melt increase to flatline, slow down, or even be linear. As the ice thins, the surface/volume ratio increases, which should increase the rate of melt. If the winter volume flatlines, why would summer melt increase? You can't now argue 'as the ice thins' because it will be same thickness with winter volume flatlining. Surface/volume ratio is useful for speed of ice cubes melting in your drink. However in this case heat is plentiful and it is a matter of how quickly it melts. The Arctic could well be a different situation where there is plenty of time for things to happen but heat availability is limited by the length of the summer. OK so maybe maybe the effective length of summer increases as snow cover on land melts out earlier. That is not affected by volume of ice at maximum so that can continue. Note that I don't expect winter volume to flatline - there are still GHG increases, temperature increases, and probably ocean upward heat flux increases. Because I don't expect winter volume to flatline, I expect summer melt to continue to increase. However I do see lots of potential for the rates of these to slow down. The availability of heat for melting is also very dependent on atmospheric and oceanic currents, which are not so easy to predict. There is already plenty of heat at depth in the Arctic to melt the ice. It seems certain that as the melting of the thin ice happens earlier in the season, this will lead to more warming in open waters. Is there a critical temperature at which this warm surface water surrounding the ice upsets the existing balance and exposes the remaining ice to a steady flow of warmer water - whether from below or from the periphery? Similar questions arise related to increased flow and temperature of fresh water from Canadian and Siberian rivers, as the land warms and precipitation becomes stronger. I guess I don't get your point, then. If all the ice is first year ice then, by definition, the ice has completely melted out the previous summer. If the ice isn't all first year, then there remains some MYI, and the volume decrease can continue. "Note that I don't expect winter volume to flatline - there are still GHG increases, temperature increases, and probably ocean upward heat flux increases." Nor do I expect a flatline, but post 2010 I think we're in a period after an inflection of winter peak volume. 2013 and this year's late start have messed up the pattern somewhat, so I need more years to be 100% sure. 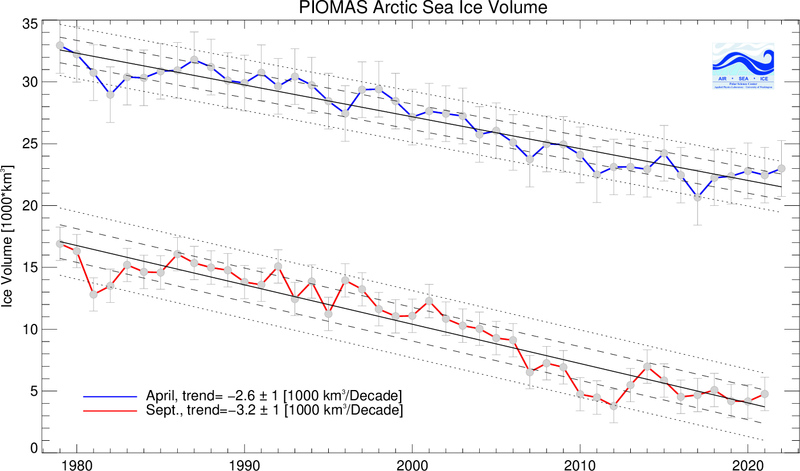 By the way, we now have four years of very similar peak April monthly average PIOMAS volume, that's what's been bugging me since I saw April's data and worked out how similar it was to 2m of ice. All figures below April volume in thousand km cubed. No they can't. By definition any year with surviving ice will make multi year ice. But whereas the maximum lifetimes of such ice was of the order of a decade in the past, now the lifetimes are mainly under four years, and it keeps getting replenished. So until we hit zero ice at the end of the summer we will always have a residual of MYI, we are at that stage now. EDIT in italics. MYI might actually end up thinner than FYI the year the arctic melts out. See the Canadian basin last winter the MYI left over from 20143 was mostly 1-1.5 Meters thick and it only grew .3 to .4 meters more. while new FYI West of their in the Chukchi region grew 2-2.5M. That MYI being ravished was probably not much different than the FYI at that point but becuase of it being an insulator the ice couldn't out grow the FYI. So volume wise it's a way to lower volume even further then an entire sheet of FYI. Unless one takes the last two years as the new trend, an extrapolation of those curves says that the 4-years ice is basically done (i.e., down to a couple percent, which is likely less than the uncertainty in the measurements), the 3-4 and 2-3 year ice is pretty much the same plus or minus a year or two. That really only leaves 1-2 year "MYI" in any quantity and that's maybe 10% to 20%, which could easily get taken out in a warm year -- heck, it could all just float out through the Fram if the wind blows hard enough. It seems to me that your argument is that since the MYI is mostly gone, we've basically shifted gears into a new quasi-stable equilibrium, and are now approaching "ice free" asymptotically rather than exponentially. Is that a fair characterization? Got some niggles about the use of asymptotic, but I get why you use the term. I guess my mind was wondering what happens when the summer/autumn heat budget is so great that the winter freeze over only locks in the heat in the ocean. At which point a sea that is above -2 is going to melt the ice from below all winter long. With only the severe cold and accumulated snow keeping the ice above. In fact more snow will drive the ice further into the warm water creating more melt, rather than growth. Yes I know it won't happen any time soon and that we see pretty much all the ocean dropping below -2 in the winter; allowing the ice creation to reach 1.5M or 2M pretty early in the season. I could be wrong, but that heat has to go somewhere. Yes it can cycle out or dive deep but, at some time, it's going to remain close to the surface. I'm guessing that point comes when we start to see coastal water temps hitting 12C - 14C for extended periods of time (months). Maybe I'm jumping ahead a decade or two. I don't know. The only thing I can know for sure is that the Arctic is going to surprise the hell out of us every year until it does whatever it does. "Sea that is above -2" doesn't "melt the ice from below all winter long" either. When the air above the ice is -20 and the water underneath it is -1.7 or so the ice just keeps on getting thicker! I don't particularly agree with your assessment, but I can see why you would come to that conclusion. I guess time will tell. We should probably agree on what "ice free" means, beforehand, though. I mean, it's going to be hard to get to 100% ice free waterways with Greenland sitting there dumping gigatons of thick ice into the ocean all year every year. But when do you stick a fork in it? At 95% extent reduction from, say, the 1980's average? Or maybe 98% volume reduction? I'm not really sure myself -- but I've been thinking along the 95% or 98% lines. At that point it's unmistakably a new world (not that it isn't already, but you get my point -- nobody could look at it and claim "natural variation"). From a number of old research articles, the rule of thumb I worked out was that you'll get approximately 10CM of ice per degree C below the freezing point of seawater (about -2C). So NeilT, -20C would produce ice about 180CM thick. The insulative qualities of ice impede heat flow such that ice can't thicken much past that - heat flow from the ocean prevents the phase change at the bottom of the ice. Ice much thicker than 3M requires ridging in any event; the ice places such a cap on heat flow there's just too much energy available. Now, without heat input from somewhere, you'll not get anything but the most trivial bottom melt if the temperature rises. No continuous bottom melt in the middle of winter. My sense of things watching events in the past is, you don't really get a lot of bottom melt until the ice reaches thermal equilibrium with the water it is sitting on - namely, reaches about -1.8C. Once that happens, more of the energy input into the system can get directed towards causing a phase change rather than raising temperature. I doubt it too, but not in a way you do. My doubt is related to the lack of complete knowledge of all possible major factors which influence Arctic melt mode. There is, if small, possibility that anthropogenic (man-made) change may be a major factor - few years ago, i've seen a part of a very serious discussion of a few very serious scientists which i (nor any member of general public) was not supposed to be able to see, and it mentioned that "we have to start it in 2013, otherwise it'd be too late" - they were talking about cooling the Arctic artificially. I do not exclude the possibility that they actually started to do it, exactly in 2013 indeed. - vast areas of shallow Arctic continental shelf are now open to sunlight for a large part of high insolation months. Those will release methane in rapidly increasing amounts. Some already do, since ~2010. We talk ~hundred million of tons of the gas - annually. For now. In some 10...20 years, it may get to Gt-scale. I hope you do know GHG properties of methane. If you do not, you should. What's not usually mentioned, though, is the local effect. See, methane GHG potential is multiplied by high insolation during Arctic June/July, - i mean that the more energy comes in per day, the more energy (in absolute numbers) end up being trapped by the same amount of GHGs. Plus, local concentrations are, of course, much higher than worldwide averaged methane content, - this is also sometimes forgotten. Last but not least, local warming above/at Arctic shallow continental shelves which contain much methane clathrate not far from seabed, - will of course create self-reinforcing feedback: the more methane ends up in the air in the region (for a substantial time) -> the more energy is trapped by this methane's GHG effect -> the faster warming goes -> the faster methane gets released. In a sense, now-nearly-complete loss of MYI was one big thing shaping the mode of Arctic melt, yes, - but methane release in Arctic is likely to become the "next big thing", you see. If you are not familiar with dr. Shakhova and dr. Semiletov papers and interviews - perhaps you'd like to seek them: those are scientists who are working there, in the field, in Arctic, and their work is much about methane clathrates (among other things). Findings are not exactly... encouraging. - Thermal inertia and recent massive warming of Arctic. See, Arctic surface temperatures rised up much higher than world average during late 20th century and 2000s ( http://appinsys.com/globalwarming/RS_Arctic_files/image026.gif ). Estimates vary, somewhat; personally, i estimate Arctic is now some ~3,5C above pre-industrial, if not more. And most of this change happened after 1990. Thing is, thermal inertia is a huge thing in all large things oceanic. Arctic is not an exception. Again, estimates vary, but general agreement is some 30...40 years - is the time which is required for any deep ocean to get saturated with heat enough to approach the new equilibrium. During this time frame, ocean absorbs much of the energy which otherwise would go towards increasing surface temperatures. But obviously, as it does so, - it loses its potential to do so (granted that forcing would become stabilized - which is, of course, not the case; i am just trying to illustrate physics of it). End result is: what melt we've seen so far - is mostly the result of things done some 25+ years ago; things done since then - in 1990s, in 2000s, and last few years, - are mostly not yet reflected by the state of Arctic ocean (and thus, its ice). Yet, we know what were the things done during last ~25 years - namely, mankind emitted about as much carbon dioxide as it did during all of its previous industrial history (yep, just in 25 years or so! ); massive increase in forest fires average strength and amount, resulting in more CO2 into the air; methane content has rised, too; industrial and transport activities in Arctic more than doubled. - Thermal inertia and recent massive warming of Arctic. See, Arctic surface temperatures rised up much higher than world average during late 20th century and 2000s ( http://appinsys.com/globalwarming/RS_Arctic_files/image026.gif ). Estimates vary, somewhat; personally, i estimate Arctic is now some ~3,5C above pre-industrial, if not more. And most of this change happened after 1990. Thing is, thermal inertia is a huge thing in all large things oceanic. Arctic is not an exception. Ice at surface holds the temperature to freezing. Before freezing recommences in the winter, most of the heat has to be lost. I am not entirely sure how deep a column this applies to. Likely some heat is accumulating below this depth, but with water generally sinking rather than rising, I suspect any effect at surface is pretty weak. Certainly I don't expect some bombshell hitting the Arctic after 30-40 years of GW. Could we get a moderator to split off all the posts about Chris Reynolds 'Slow Transition' blog entry? It all relates to later years than 2014 in this thread. I do - with a caveat that it won't be CO2 per se, but CO2e (CO2 equivalent, which includes CO2 itself, methane, N2O and (insubstantial so far) other GGHs). In 1998, world athmosphere was at 412 ppmv CO2e (source: IPCC). In 2012, world athmosphere was at 509 ppmv CO2e (source: Blasing, T.J., Current Greenhouse Gas Concentrations). By 2020, it may well reach 600 ppmv CO2e, given the shape of the trend. Plus there is the local amplification above major GHG emissions sources, as mentioned in my previous post. Pre-industrial athmosphere was some ~320 ppmv CO2e or so, i believe. I disagree. It all relates to this melt season as well as to future and past ones. Without understanding wider picture, one can't be competent about the present events. Mathematician would say: without knowing the function, one can not calculate a value. Mighty grateful to Chris for bringing those issues in - no matter i disagree with him on some detail. He's done a great thing for this thread, imho. He should be thanked, not separated. Sure, ice-covered areas/times are different, insulating is a major factor, yes. Still not an exception though, since we talk warming - i.e., increase of open water areas/times. In such areas and at such times, it is open water - much like any other ocean. There are important details to it, of course - http://en.wikipedia.org/wiki/Brine_rejection is one, and high albedo during spring is another. The former reduces thermal inertia, the latter increases it, in terms of the whole Arctic ocean. In general, it's still about few decades, i believe - heat capacity of the 0...100m water layer of the Arctic ocean is tremendous: it is ~1,4 millions cubic kilometers of water, specific heat capacity of water near 0...10C is some 4,2 J/g*K, which means that in order to increase the temperature of this near-surface 0...100m layer of Arctic ocean by just 1 degree celcius (annual average, of course), one would need to spend 4,2* 1,4 * 10^6 //"millions"// * 10^9 //cubic kilometers to tons// * 10^6 //tons to grams// = 5,9 * 10^21 joules of energy. And this value is completely independant from means of delivery of said amount of energy: it does not matter how you put the energy into that layer of water, in practice, it is a combination of direct solar input, secondary solar input (such as re-radiated by seabed of shallow continental shelves absorbing some direct sunlight which penetrated shallow waters), ocean currents from sub-polar and other for any reason warm regions, precipitation, air currents, geothermal, volcanic and, of course, secondary radiation of GHGs. Some of these "delivery methods" even work despite the ice cover, to some or even full extent. The calculated amount of energy is, again, for just 1C average annual increase of said 0...100m layer of water in the Arctic ocean. Perspective: it is equivalent to nearly 12 times higher amount of energy than the whole mankind energy consumption as of 2010 - and yet in the same time, it is "only" 0,59% of the total Sun's energy hitting Earth each year. Of course, annual losses of near-surface energy (ultimately radiated back into space) nearly even out the input. And, obviously, Arctic is not "whole Earth", and there is high albedo of snow and ice for much of high-insolation months, too. That's why and that's how Arctic ocean, much like any other ocean, serves as a "heat absorber" for several decades after any substantial energy balance change towards warming. But with every passing year, as it gets saturated (relative to initial condition, whatever starting point you set), - its ability to absorb more heat decreases gradually, resulting in more heat ending up warming the surface (which is what we are most interested in, of course). It shows how the rate of growth (cm/day) on the vertical axis varies with the ice thickness (horizontal axis). Say you increased the length of the freeze season, you'd get only small increase in thermodynamic thickening because by 1.5m and above the rate of ice growth is small. This is because as the ice thickens it better insulates ocean (warmer) from the colder atmosphere. This is quite interesting, but wouldn't the same/similar effects likely occur in reverse in the summer, i.e. that the ice tends to melt faster the less of it is there is? It seems like your argument sort of boils down to the idea that it's easier to form new ice than to melt it, but is that what the underlying physics really suggests? No, no. You're getting it all wrong. You see, graph presented is about a case when there is no insolation to talk about (at the pole, this starts as early as ~20th September). In such conditions, after several dozens hours, the air naturally cools down to much below 0C (as it radiates some of its energy into space, and there is no Sun to warm it up in a daily 24h cycle). In such conditions, there is a big difference between air temperature (which is much below freezing point) and directly-at-the-surface water (which, because of its huge thermal capacity and convectional mixing cools down dozens, if not hundreds, times slower - and sometimes remain liquid even at surface for quite a while after the Sun goes below the horizon for the polar night). The surface of the ocean is rarely exactly plain as long as it's liquid water - because of winds, there are nearly always some waves, quite often big ones. Mechanical motion creates mixing, and for a while, this prevents ice layer from forming. Not for long though, and depends on conditions. Low/no wind and/or snowing eventually happen, and this is the start of ice formation. Once even very thin layer of ice has formed, THEN you start to see what the graph is about: very rapid growth of ice initially, provided very cold athmosphere (below -20C) remains (which is usually the case). But the thicker ice gets, the better insulator it becomes: i.e., the less thermodynamic interaction there is between cold athmosphere above and liquid water below. That's why the growth slows down the thicker ice gets. The graph importance is _how_ - quantatively, - this process happens "with everything else being the same". I.e., if the water udner the ice suddenly changes to be much warmer than near 0C - then the graph is irrelevant; won't describe things happening. If the air above gets above 0C, or when polar night is not the case anymore - i.e., it's spring time, - the graph is also irrelevant. And no, the graph presented does not apply to melt. During melt times, there is the Sun, which is very, very major factor - deciding factor; there is secondary heat from the Sun - re-radiated by air, by GHGs in the air, by water in any currents which go directly under the ice and even - to lesser extent, - from deeper yet warm currents (Gulfstream remains in the Arctic are known to get somewhat deep at places, for example), etc. Melt is happening completely differently. It's more like "pulsing mode", instead of "rapid first, slows to crawl later" or "crawl first, accelerates to rapid melt later". There is, if you will, "breathing" when Arctic melts - it goes in somewhat rhytmic big chunks, quite often. The main "initiating melt" mechanic is, afaik, warm water and air currents (significantly above 0C), which "intrude" into cold enough "so far" areas. Air currents warm them up to the point of melt ponds on the surface (albedo plummets - direct insolation starts to work full-time). Water currents warm them up "from below", decreasing thickness of ice and fragmenting ice fields into "chunks", with bits and pieces of open water (which does not refreeze as long as warm water current is there), and then the more open water there is, the more direct sunlight absorbtion kicks in. When strong warm air and water currents "attack" an ice-covered region, it often "bursts" into open water incredibly fast. If it's clear sky and the time is May...August, then it can be amazingly fast. Where those warm water and air currents come from? Warm water comes from already ice-free regions, and for shore - from the rivers, too. Warm air comes from same places and - later in the season, - gets very warm in the Arctic itself whenever it's not heavy clouds in the region (especially with higher and higher GHG content, it happens faster and to higher temps). A small fraction of sunlight gets absorbed by the snow and ice too, but i believe it is a secondary melt mechanic. So you see, the freeze is driven, primarily, by local process: the air "here" gets cold (without the sun), and it freezes sea surface "here" to ice; but the melt is primarily driven by inter-regional processes: the ice "here" is cold and it's reflecting most of sunlight, not allowing water below to warm up and only slowly warming up itself, - but water and winds from "somewhere else" come in, and do the lion share of melt. Of course melt can't be defined by a graph which defines freeze - melt is much, much more complex thing, since it's not a local process. I think you make a valid point. The warmer the winter, the thinner and warmer the resulting ice. When it comes to the melt season, thinner, warmer ice will start to melt sooner. When you add the warmer summer, plus all the heat the ocean is absorbing globally (and the arctic ocean in particular absorbing ever-warming runoff from the continents), you get more melting. As the polyna's become larger, the water absorbs even more heat -- a positive feedback. All of these processes are ongoing -- every year a "little" more heat is added to the global system. (E.g., June had the largest SST anomaly for any month, ever.) That's why I don't see any slowdown in our future -- at least until and unless global warming reverses. Transfer of comments is complete. I'll reply to comments I haven't replied to shortly. Neven raised an important point at my blog that I've not seen raised in the above comments - sorry if I missed it. I'll try to make my reply a little less rushed than on the blog. With reference to Bitz & Roe "A Mechanism for the High Rate of Sea Ice Thinning in the Arctic Ocean" JoC 2004. A general theory is developed to describe the thinning of sea ice subjected to climate perturbations, and it is found that the leading component of the thickness dependence of the thinning is due to the basic thermodynamics of sea ice. When perturbed, sea ice returns to its equilibrium thickness by adjusting its growth rate. The growth–thickness relationship is stabilizing and hence can be reckoned as a negative feedback. The feedback is stronger for thinner ice, which is known to adjust more quickly to perturbations than thicker ice. Consider first year ice, it is able to grow back rapidly in response to loss of ice, as seen in 2012 in just one winter first year ice can get volume back to where it was before the loss. Note that in 2012 the loss was from a pre-existing state of a mainly first year pack. So FYI can 'heal' quickly and has a short 'memory' of impacts on it. Contrasting with this is multi-year ice. By defnition it takes years to grow, so if an event removes it then it takes years to recover. In essence it has a long 'memory' of impacts upon it. In an environment where factors act against ice survival this long memory means MYI never gets the chance to recover so it just continues declining, until there is a residual amount due to ice extent not dropping to zero at the end of the melt season. So Neven asks what will become of the energy that has been going into causing the precipitous decline of sea ice volume if that comes to an end. I had thought that this energy would go into thinning winter sea ice - I was wrong in a way that showed I hadn't been thinking about Bitz & Roe. The energy that went into melting MYI in the past will still go into melting FYI and MYI. But MYI will be more rapidly replenished as it's mean lifetime is now much younger than in the past and there is less total extent of MYI. But each autumn the FYI and thinner MYI will thermodynamically grow giving back the energy it took to melt the ice, and due to more open water and thinner ice there will be more heat vented to the atmosphere from open water gaining energy due to the ice-albedo feedback. So the short answer to Neven's question is that the most of the energy that went into melting MYI will actually go into the atmosphere and then be radiated into space. And each summer a larger proportion of FYI will melt than did in the past, but it too will give up its energy and ice volume will once again grow (to around 19.3k km^3 - declining slowly in the coming years). I think Overland and Wang's 'virtually ice free' definition of less than 1M km^2 September (NSIDC) extent is reasonable. I think we know enough to say that an inflection in winter volume is underway, unless someone can show that substantial winter thinning is going to happen, and happen fast. In the winter of 2012/2013 we saw more FYI than any other year we have data for, but that's just a low point in a longer term shift to FYI. The fresher ice in FYI is already having an impact, why suppose it holds non linear surprises unless you can show it does? Volume loss events: 2007 was caused by an atmospheric event, 2010 was caused by a winter export of a lot of MYI. I've been unable to find strong links between global SST and volume loss. Although there may well be a role for the AMO + AGW ocean warming in the loss of Arctic Sea ice, particularly the decline in Barents and Kara. I agree with Archer that the methane issue is chronic not catastrophic, I've yet to see any evidence of a local effect that will play a strong role in the next few decades. You ask if I am familiar with Shakhova & Semiletov, yes, very, I have 52 papers on Arctic methane 8 by Semiletov/Shakova, 2 of which I had to purchase direct from Doklady Earth Sciences. Yes, committed warming, I do know about that. You say: "How exactly you can expect any sort of stability in such conditions - is beyond me." Do you think it is a coincidence that April volume for the last 4 years has been within 1.5% of the volume one would expect for an Arctic Ocean of 2m thick thermodynamically grown first year sea ice? If you do fine, I can be patient, if you don't then to get a rapid crash you either need to demonstrate a way to drop winter thermodynamic growth rapidly (it's dropped by 1.5cm per year so far - I've taken that into account), or a way to get much more melt in the melt season. With regards the energy that went into melting ice volume in the past, see my relayed reply to Neven above. Thanks for copying the posts to here. Your 19.3k km^3 came from an area of 9.65M km^2 and thickness of 2m assuming "thinner ice at the Atlantic edge is to some degree offset by the thicker ice in the Central Arctic". "2m * 9.65M km^2 => 0.002km * 9650km^2 = 19.3k km^3"
Suppose instead we assume the distribution for thickness of up to 2.5m is identical to 2014 at maximum. Above 2.5m, suppose the band of thick ice off Greenland/Ellesmere/CAA is reduced to half the width so half the remaining area is 2.5m thick and the remainder follows the 2014 distribution pattern at maximum with half the area for each thickness band. We have certainly seen this band of thick ice get narrower as well as less thick so this seems plausible to me. Would the volume at such a future date maximum then be much less than 19.3k Km^3? Would this smaller volume mean some additional volume melt in the melt season and can this extra melt volume be estimated? 2 or 3 cm thinning of thermal equilibrium thickness over next 10 years also seems quite plausible. Which has bigger effect on volume at minimum? Are you sure you don't end up with a combination of effects that results in a bit less volume for a few more years yet? To put what would be required to deliver a summer melt out without a decline in winter thickness (volume) I've done the following. Taking a pre-existing calculation and plot of PIOMAS change of volume in ten day increments from 1978 to 2014, shown in blue. I've calulated the average volume on 11 April 2007 to 2013, the first zero crossing that's 23.06k km^3, note that my previous calculation of 19.3k km^3 is for the Arctic Ocean only, the 23.06 figure and the plot below are for the entire PIOMAS domain. I've then taken the average ten day change of volume for 2007 to 2013, and have manually scaled this until I get zero volume on 18 September. The ten day increments of volume change for that are then plotted as the red plot. Note how much more massive the loss rate is for the 'to zero' case, especially at the point of maximum loss. The only year that even approaches it is 2012. But things are even harder for the 'to zero' plot. Because that plot shows all years from 1978 to 2014 further detail can bee seen: Note how during the early half of the melt season, within each ten day increment the slope is downwards - there is an increase in early summer loss rates, but see how it is dwarfed by what is needed throughout the season to achieve zero. And in the individual late season volume change rates it can be seen that after the peak loss rate around the solstice loss rates are actually declining, there is in reality less late summer loss of volume than there was in the past. The factor by which I have multiplied the 2007 to 2013 loss rates is 1.258, in other words each ten day increment loss rate needs to be 25.8% greater than the 2007 to 2013 average to get volume to zero from the average volume on 11 April 2007 to 2013. OK, so maybe I'm being a bit demanding looking at zero volume. What about a volume on 18 September of 1k km^3? That would need a multiplying factor of about 1.203, or only a 20% increase of loss rate throughout the whole summer. Sorry for the delay in replying - been doing some calulations for this reply. My calculation is merely to show what I think is happening now, that the levelling of April volume is due to FYI dominance. I am certainly not saying there won't be further thinning - there will. But not at the rate implied by past volume loss. That is all I am saying. Yes there is wiggle room in the 2m thickness, some years a bit more, some years a bit less. But how much less? But there will be differences between the PIOMAS grid and NSIDC grid Wipneus uses. The data is so noisy that I'm not sure how you can justify the claim that the April ice is leveling off. From the thickness data, you state that the thickness has been level since 2011. But couldn't you equally say that the thickness was level from 2007-2010? I think you are on stronger ground when you assert that the ice must level off for thermodynamic reasons. I don't think the observed data is nearly strong enough to make that claim, unless you can back it up quantitatively. Hmm, I think you are seeing a pattern where there isn't one. There are plenty of examples of in that list of three or four years where there is a steady decline previous to it and then a rebound a flat line and then steady decline after. It looks more like we are in the rebound or regression to the mean and then back to steady decline a year or so in the future just from eyeballing it. from a thermodynamic perspective it's hard to see how a flat lining of melt rate is even possible in the short to mid term outside of the chaotic influence of weather. Co2 is increasing year on year, increasing radiative forcing and ocean heat flux is steadily on the rise which will see increased melt rates from top and bottom of the ice. Given those I hesitate to call them facts but given that I don't see how a flat line is possible. You would need to demonstrate some mechanism by which the heat is lost faster in the Arctic to offset the increased forcing and heat flux in the ocean to allow for your hypothesis to be viable no? The thickness data above is to work out average thickness of 1.943m * area 9.65M km^2 = 18.75k km^3. Or the central Actic basin only figures on Chris's blog. For the above, the range on the last 4 years is 0.58. The next lowest range for a 4 year period is 0.898 for 1988 to 1991. The big gap between 2010 and 2011 however raises a query as to whether this data is slowing down. The calculation could be done taking account of the thin ice and this would arrive at a lower total than 18.75k km^3. Thanks for the comprehensive answer, Chris. I figured as much that the heat will be transferred to the the atmosphere, and then radiated out to space. Too bad I can't quantify how much will be radiated and how much stays in the system, and whether this has any significant/increasing effects. Maybe one day I'll understand this. Let's look at the PIOMAS April volume, instead of the thickness. With only four years of data, there's no statistical support for the claim that the April ice has stopped declining. I plotted the April PIOMAS volume for 1979-2014, then added the linear fit for 1979-2010. The first thing you notice is that all of 2011-2014 are below the trend line. (In fact all of the data since 2005 is below the trend, because the ice loss has been nonlinear.) The trend has a slope of -0.24 thousand cubic km per year. Then I performed a hypothesis test that the slope of the data for 2011-2014 is not -0.24, and I got a p-value of 0.11. If the p-value turned out to be less than 0.10, I would agree that there is limited statistical support for the claim, but at 0.11, there's no support that the volume has leveled off. The data is so noisy that 4 years of data can't support the claim that the current trend is different than the long term trend. Like I said, I think Chris Reynolds is on stronger ground with the claim that the April volume must plateau for thermodynamic reasons than with the claim that the data of the last four years shows this. I think it is an important point that some have missed that multi-year ice has declined about as far as it can go. Any component of ice loss due to loss of multi-year ice is basically over. Look at a chart of multi-year ice such as at NSIDC and see that declines of 2-4 year ice have basically stopped since 2007, and there is a small amount of >5 years that has shown some further decline, but from a very small base. We are now at a point where whatever 1st year ice is left in September becomes 'multi-year' ice for 2-4 years which is the time taken for the ice to move from formation on the Russian side of the Arctic then to the Greenland side, and then either into Beaufort or out Fram strait to die. However I consider the loss of volume in 2010 to not be related to loss of multi-year ice - there wasn't much multi-year ice lost that year, and according to PIOMAS anomalies the loss of volume was mainly early in summer and corresponded to an unusually warm period of weather. But I think it is reasonable that the 1st year ice in April will be thinner over time as the world gets warmer. Not because of a shorter freezing season, but due to milder temperatures at the coldest part of winter. Thermal equilibrium will occur when the thickness of ice is enough to slow down the gain of heat of the ice from the water below to balance the loss of heat to the cold air above. If the cold above is weaker, then less insulation is required to balance the gain of heat from the water below. Naively I would expect that the thickness of sea ice at thermal equilibrium would be proportional to the difference between the air temperature and freezing temperature. DMI suggests the average difference north of 80 N is about 30 deg C. I'll halve this to 15 deg for the entire ice sheet by ignoring the size of the 80 N area, and assuming that the rest is uniformly distributed between 30 and 0. If we look at warming trends over the last 30 years we would be looking at something like 2 degree warming since 1980 (eg here). This equates to 2/15 * 2 m which is about 25 cm loss of thickness due to warming. This is a very crudely calculated value and compares to an average loss of thickness of maybe 70cm according to stats posted in this thread. However if my reasoning is correct it would imply that ice thicker than the thermal equilibrium would tend to melt, and so old multi-year ice wouldn't get much above 2 metres unless it is fairly continuously thickened by rafting over itself to counteract this melting? Another thought I've had on this topic is that the greenhouse effect in summer in the Arctic is going to be in one sense weaker than just about any other time or place on the planet (except Antarctica). By this I mean that the infrared energy available to be trapped by Co2 is low because the ice is cold, and the solar radiation is higher than even at the equator. This incoming solar radiation is mostly not converted to heat that can be radiated as infra-red, but it melts sea ice and cannot be radiated as infrared to be trapped by CO2 until the ice re-freezes in Autumn. So I suspect that Arctic ice loss is a combination of a lower ice amount at the end of winter directly related to greenhouse warming, feedbacks such as albedo and loss of multi-year ice during summer, and perhaps a warmer world in general resulting in more heat being imported from warmer parts of the planet. Naively I would expect that the thickness of sea ice at thermal equilibrium would be proportional to the difference between the air temperature and freezing temperature. It may take several years of growth and melt for ice to reach the equilibrium thickness. In the Arctic, the thermodynamic equilibrium thickness of sea ice is approximately 3 meters (9 feet). However, dynamics can yield sea ice thicknesses of 10 meters (30 feet) or more. The net heat flux is a total over four components, which are latent, sensible, longwave and shortwave fluxes, respectively. The equation can be solved using a numerical root-finding algorithm such as bisection. While Cox and Weeks assume thermal equilibrium, Tonboe uses a more complex thermodynamic model based on numerical solution of the heat equation. This would be appropriate when the ice is thick or the weather conditions are changing rapidly. That seems to indicate that equilibrium thickness might be as high as 6m and that would take some time (years probably) to reach. Therefore I think it is clear that the thermal equilibrium thickness varies depending on conditions: ocean upward heat flux, air temperatures, ghg levels etc. We are now talking more like 2m for typical thermal equilibrium thickness and this is a thickness that can melt out depending on its location. Take a far south location like Hudson or Okhotz which has a fair amount of incoming heat from lower latitudes. If the ice only gets to 50cm thick, does this mean that this is nowhere near the current equilibrium thickness of 2m or is thermal equilibrium thickness for that location something like 52cm? I think the Thorndike 1975 graph shows you get fairly close to the thermal equilibrium thickness within ~25 days of the closest winter weather. 1. Properly reflects the variability (time and location) in thickness of a thermal equilibrium thickness. 2. Is term thermodynamic equilibrium being used properly? 3. The 3m seems too high for current conditions. Given they are experts and I am not, it could well be me that is wrong. I haven't gone back to the original paper, but the graph certainly doesn't specify the atmospheric forcing. I'd surmise that was rather different in 1975! Dynamics is explicity excluded as far as I can tell, and has a section all to itself on the NSIDC FAQ. I doubt that a single figure will cover the (non dynamic!) thickness reached in different parts of the Arctic over a single freezing season. As far as I can see from the ice mass balance buoys first year ice (of which there is a lot more now than in 1975) had a lot of trouble reaching 2 m anywhere in the Arctic last winter. As you say, they are the experts! I don't know when that was originally written. It certainly seems too high for conditions at the end of winter 2013/14. Maybe this should be in stupid questions section, but as it was brought up I will give it a shot here. It has been brought up many times that in winter heat from open water gets released to atmosphere then radiated to space. In a closed system I can see that and in a stable jet stream era I can see that. The question I have would not in a weak jetstream era, where there is far more interchange of weather between the Arctic and farther south occurring would that not change how much heat is lost into space? Would there in fact be an actual magnifying increase as more southern heat is pushed into the during the winter as seen in 2013-2014? I know there are satellites observing heat balance, are they capable to see a change in winter heat loss in the Arctic and do they match what thermodynamics says should be happening or are there other forces at play that are changing the equations. Another issue I see impacting sea ice is the melting permafrost. That is very hard to replace and that also creates a massive heat sink. Another factor that is rarely mentioned in industrialization. "All truth passes through three stages: First, it is ridiculed; Second, it is violently opposed; and Third, it is accepted as self-evident." I was going to ask a similar question (similarly thinking it ought to be on the SQ thread!). In particular, whether winter heat released into the atmosphere might not have the ability to increase the frequency and severity of storms. Physics always takes precedence over maths when dealing with physical issues. Yes, I may be wrong on my physical argument, but the lack of statistical strength is irrelevant to the argument. If I'm right then within several years we'll see the previous trend being broken by an inflection, If I am wrong then we won't. Either way I think the agreement between the sort of volume one would expect for a nominal 2m thickness and the actual April volumes for the last four years demands one of three responses: 1) It's mere coincidence. 2) It means something. 3) Let's wait and see. But this isn't any four year levelling, it has happened at a point where the volume just happens to be in the same ballpark as that one would expect for a pack dominated by first year ice thickening thermodynamically over winter. It is quite possible for the energy that has gone into past volume declines to simply 'vanish'. There is a mechanism by which enormous amount of heat can be lost from the ocean - increased open water in the autumn and thinner ice over autumn and winter. e.g. See Tietsche et al. Even with total removal of ice in a model recovery to pre-removal conditions happens within two years. The winter warming profile with height is strongly surface based -the heat is being emitted from the ocean by autumn open water, and thinner ice in the ocean. Autumn open water has been observed to cause storms along the ice/open ocean boundary (in 2007 IIRC). The direct atmospheric effects of loss of ice in models are localised. The wider spread impacts are complex and subtle. As you both note, there other places for such questions. I don't want to be too critical on this, but I did copy the responses above from another thread to avoid diluting the discussion there. Thanks, Chris. Apologies for the interruption. Current forcing vs 1975 forcing is largely irrelevant. 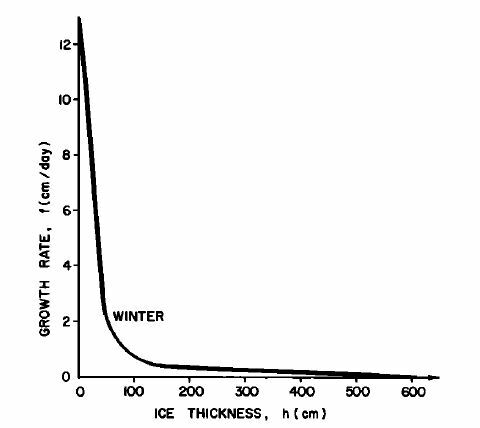 What drives that (Thorndike 1975) curve is the thickness of ice and the fact that as ice thickens it insulates better, thus reducing heat flux to the atmosphere and reducing the accretion of new ice at the ice/ocean boundary. On my blog Nightvid raised a point about winter warming, here is my reply, which also addresses what you are saying. Yes winter warming will increase and will lead to thinning of thermodynamic growth. But by how much? The warming over the pack in winter so far has been of the order of +5degC over the last 20 years. Lets say that over the next 20 years there is a warming of another 5degC - There may not be, there is a limit to how much heat the ocean vents unless the melt season produces much earlier open water. This takes winter (Oct - March) temperatures from about -23 to -18degC on average (N of 80degN). Given the strong rate of ice growth and thickening in recent years in the early part of the freeze season when average temperature is around -19degC, I'm not sure we can expect winter thickness (volume) to reduce to such a degree that reasonably expected rates of summer melt can remove virtually all the ice. I should have finished "that can remove virtually all the ice within a decade." I still think the Arctic is on a trajectory to a seasonally sea ice free state, I just don't think it will happen before 2025 - i.e. roughly ten years from now. When I talk about thermodynamic thickening I am talking about the typical thickness ice can thicken to from open water in September to April, when in the Arctic Ocean volume starts to decline. Yes ice can thicken more over subsequent seasons but this tells us nothing about the situation with regards first year ice, which is at the core of the argument. I have updated my original blog post with a series of images of regional thickness. Because of a suggestion by Dromicosuchus, in the comments. No need to apologise Anne. What about snow and ridging? Have you got any references with data that show them as being stable or not able to change enough to have a significant effect? Chris has provided references about thinner ice being weaker but I think it is also a matter of time being needed to thicken the ice and the age of MYI has declined from circa 10 years down to ~4 and Chris is arguing that this can't go much lower. Also looking at ESS thickness graph on Chris's blog, the rate of thinning slowed dramatically once thickness got down to 2m. We are approaching this for much of central Arctic basin, and if there is little change in ice thickness or age of MYI why would there be a change in ridging? Increased snow in Autumn seems a distinct possibility but this can cause thinner ice but slower start to melt season which are offsetting effects. Presumably such changes have been happening and change will continue to occur. But do we know whether the net effects are significant? "Recent changes in the dynamic properties of declining Arctic sea ice: A model study" Zhang et al, 2012 GRL. The decline in ice volume results in a 37% decrease in ice mechanical strength and 31% in internal ice interaction force, which in turn leads to an increase in ice speed (13%) and deformation rates (17%). 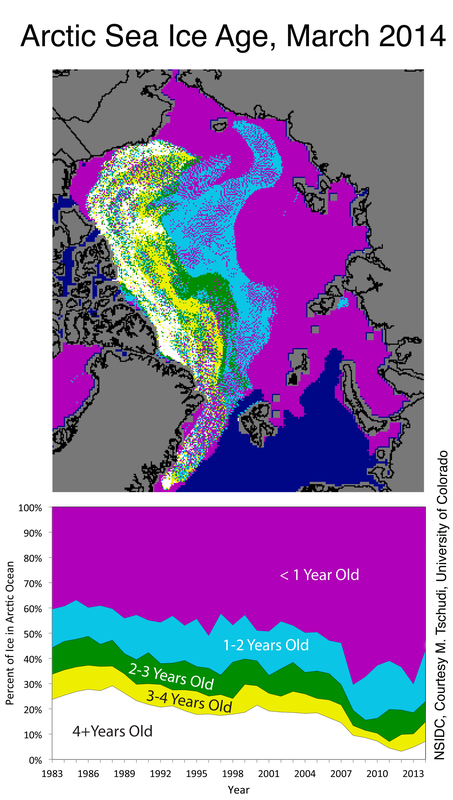 The increasing ice speed has the tendency to drive more ice out of the Arctic. However, ice volume export is reduced because the rate of decrease in ice thickness is greater than the rate of increase in ice speed, thus retarding the decline of Arctic sea ice volume. Ice deformation increases the most in fall and least in summer. I have the whole paper if it is paywalled and you need a copy. Snow is interesting. An increase in autumn water vapour should increase snow, but whether this happens when there is sufficiently thick ice to hold it and stop it getting wet so it can remain a good insulator into the winter - I do not know. Certainly there is an isotopic signature of Arctic Ocean water in snow over northern Eurasia which has been used to link loss of sea ice to rapid snow advance in autumn/early winter over northern Eurasia. Increased snow should insulate the ice surface and reduce thickening. At best the graphs I posted, that Crandles points out, suggest that there may be a recent levelling in Beaufort, ESS, CAA, and Central, although except for ESS the period of possible levelling is too short for confidence, and local effects can mean the thermodynamic growth in small localities varies significantly from the typical 2m thickening over a winter. The Permian–Triassic extinction event, a.k.a. the Great Dying, occurred about 250 million years ago and is the most severe known extinction event. Up to 96% of all marine species and 70% of terrestrial vertebrate species became extinct; it is also the only known mass extinction of insects. If you're having trouble grasping it, just tell me what you don't understand and I will try to explain better. Thanks for the thread, Chris. This will be a valuable discussion especially if the baton has passed from exponential (or other) fit to Gompertz as the best representation of reality. Snow is interesting. An increase in autumn water vapour should increase snow, but whether this happens when there is sufficiently thick ice to hold it and stop it getting wet so it can remain a good insulator into the winter - I do not know. Models project a decline in snow depth on the Arctic sea ice, I think. E.g. ... Snow depths in April on Arctic sea ice decrease over the 21st century in RCP2.6, RCP4.5, and RCP8.5 scenarios. The chief cause is loss of sea ice area in autumn and, to a lesser extent, winter. By the end of the 21st century in the RCP8.5 scenario, snowfall accumulation is delayed by about three months compared to the late 20th century in the multi-model mean. Mean April snow depth north of 70°N declines from about 28 cm to 16 cm. Precipitation increases as expected in a warmer climate, but much of this increase in the Arctic occurs as rainfall. The seasonality of snowfall rate grows, with increasing rates in winter and decreasing rates in summer and autumn, but the cumulative snowfall from September to April does not change. I don't understand your basis for claiming that the rate of melt will not continue to increase until there is no ice left. 1. The increases in melt are a result of rapidly declining maximum volumes. During melt season, this causes lower albedo from thinner ice and more open water formation. Lower albedo means more energy capture that can go into melting ice. 2. These rapid declines in max volumes have largely come from conversion of thick MYI to thin FYI. 3. The area and age of MYI is such that there can be little further reductions leaving only a slow rate of FYI thinning. Therefore max volume decline will slow down and so will increases in melt volume. Which parts of which steps is not clear to you? I think the argument that the decline in max volume will flatten is likely correct. But that's the only part I agree with. If increases in melt are due to more open water, are you claiming that there will be less open water? Because it seems the opposite is what is happening and will continue to happen. More open water earlier in the season, as well as many other factors all pushing the system towards more melt. It seems to me that the argument that increased melt is caused by declining max volumes is putting the cart before the horse. Not less open water but the rate of increase in open water will slow down if the max volume declines at a slower rate. Why cart before the horse? A melt season starts at the max volume doesn't it? If max volume was only 15K km^3, I think we would all agree that the ice would melt out. If you don't think that declining max volume causes the increases in melt when the literature is full of talk of albedo feedback being the dominant cause of change during the summer, what do you think is the main cause? That graph shows melt season volume losses, i.e. from April max to September min. Those are the upper series of line plots in light blue, red and green. It also shows the interannual volume difference - difference of volume from year to year. After the 2007 volume loss event the annual range of CT Area (and NSIDC Extent) goes up. This is because losses in the melt season have increased, and this has been compensated for by increased freeze season gains. After the 2010 volume loss event spring volume loss has become more aggressive, up until weather intervened this year to mute the response, this pattern had even started this year. You will note that in the first graph of this reply I have provided the trend line from 1978 to 2006, and have left 2007 to 2009, and 2010 to 2013's summer losses as seperate. This is to highlight what has been going on. Those two later periods are well above the earlier trend, and there is reason to expect that they are actually discrete increases in volume loss during the melt season. The 2007 volume loss event thinned ice massively causing a large net movement from ice volume in the 2 to 3m thickness band down to the 1 to 2m thickness band. This has increased the ease with which open water can be produced and led to greater extent and area losses during the summer. The 2010 volume loss event was followed in 2010 to 2013 by increased losses, notably in the Central Arctic. 2009 shows a similar increase, but it is far less marked than in 2010 to 2012 and was more like 2013. What is causing the loss in spring is massive thinning of much of the Central Arctic. This plot shows PIOMAS volumes in four thickness bands. It can be seen that the 2m to 3m band loses substantial volume in 2010 and volume moves down into the 1 to 2m thickness band. As a result the Spring Melt (May to June losses) is markedly more in the 1 to 2m band, and less in the 2 to 3m thickness band after 2010. Furthermore PIOMAS has been shown to exhibit very aggressive early melt season volume losses when April thickness is thinned by 1m, leading to only the thickest ice off the CAA surviving to the end of the melt season. So rather than viewing the entire timeseries of melt season volume losses as a tale of increasing volume losses for one reason, I am seeing a general increase of melt with warming and overall loss of multi-year ice, with two step increases at the end of the series. Note here the behaviour of the 1978 to 2006 plot in the first graphic of this post against the linear trend. Is a linear trend an appropriate fit? Attached below are the residuals from the linear trend and a quadratic fit to the residuals. The bowing with low in the middle and high at the start and end suggests a quadratic fit tending towards an exponential would be a slightly better fit. But it would only give a slightly better fit than linear, and the fact that the post 2007 period residuals are so high above the previous residuals and the quad fit to the 1978 to 2006 period residuals from the linear trend suggests to me that the interpretation of the recent increase in melt season volume loss as an extension of past process is not likely to be sound. So the large increase of melt season losses after 2007 and then after 2010 are, I argue, due to thinning of the pack caused by specific volume loss episodes. If this contention is correct, and the contention that future April Arctic Ocean volume will be set by ice growing to thermodynamic equilibrium thickness (TET) from September to April, then further volume loss events leading to net thinning of the pack and enabling further increases of melt season losses of volume look unlikely. Because with a mainly first year ice pack further drops in volume in years like 2012 will be followed by rapid recoveries to the volume implied by the TET around the time of those drops within a few years at most (Tietsche et al).